After more than 10 hours drive, including the crossing of the Channel Tunnel, we arrived at Ailefroide. A paradise for lovers of the mountain, with options for alpine routes and sport climbing on granite of pure friction and few hand holds (I managed to try my first nail hook, and it worked!). There is also via ferrata, but I did not have enough time to have a go at it. I will do it next time. Four members of the BCC (Brixton Climbing Club) were travelling in the car. In Ailefroide we joined a group that had got there before us. We were 14 in total, between club members and guests. We stayed in the breathtakingly beautiful municipal campsite. It sits at the confluence of a couple of valleys that mark the beginning of several alpine routes. The view is spectacular wherever you look. It is set on green and flowery meadows, surrounded by rock mountains and tree clusters. Bonfires are allowed, and the toilets and showers are in very good condition (as long as you don’t choose the only shower that does not have hot water, as I painstakingly learned). Just 5 to 10 minutes away sat the guides’ office, the tourist office, the inevitable mountain equipment sale and rental shop, a bar and a Spar supermarket (home of our daily pain ou Chocolat, baguettes, cheese and saucisson; of course, beer ond wine). What you couldn’t get was mobile signal. Not at all. Apologies for not getting in touch. We got to Ailefroide on Saturday, late at night. We pitched our tents and chatted with those who were already there. Then, we jumped into our sleeping bags. In the morning we went to tackle some climbing routes, one and two pitches long. The climbing there is all about friction and using your feet. Once the body adapts to it, the routes get very enjoyable. Even before getting to the campsite Alex had been very vocal about his interest in tackling the Pelvoux traverse -an Alpine route that starts at the campsite, climbs towards the summit of Mt Pelvoux and returns to the campsite across the glacier Violettes. Alex managed to convince Stephen to go for it. The mountain guides give the route a PD alpine grade (realtively easy), however they also state that the return bit demand a highly competent team of experienced alpinists.This last fact made me wonder, since I don’t consider myself a very experienced alpinist. But as Stephen had decided to go with Alex (I feel closer to Stephen’s level than Alex’s, who is a stronger climber in general) I then decided to pack for the two-day journey. Twenty minutes after leaving the campsite the first defeat of the trip was inflected upon me -defeat and sense of failure. We met a British guy on a mountain bike. He asked us where we were going. We discussed our project with him. He told us he had recently did it with some friends. So we asked more. He first pointed to the fact that the single rope we were carrying wouldn’t be sufficient for the long abseils needed to get on top of the Violettes glacier. Stephen returned to the campsite to fetch a second one, then.The guy also gave us other details of the descent, which painted quite a clear picture of its technical challenges. At that point I decided I did not want to go up. It was something I felt in my stomach. A physical sensation that suggested I didn’t have to go. With some guilt but with conviction I asked Alex for forgiveness and said that something told me it was not for me to do it at that point. He nodded understandingly. And I started my way back. Halfway I met Stephen. I told him about my decision. He also respected it, and I think it opened the doors to his own doubts. But in the end he decided to go ahead. I returned to camp with a mixture of relief and sadness. I met the rest sitting around the campfire. They looked puzzled, and asked me what had happened. I explained it and -again- everyone nodded. I think it’s a good thing in the mountaineering culture not only to encourage others to push their limits and overcome their fears, but also to be understanding and supportive when someone says: “no, not this time”. I value all these in a great measure. Alex and Stephen managed to get to the place they had chosen for the bivy, but very late and very exhausted. That was the Pelvoux hut, at 2700 metres above sea level, which is 1200 metres higher than the campsite. The lack of acclimatisation didn’t help, as also didn’t the too short sleep in the outdoors. Finally, too tired, they wnt up the col where the Coolidge couloir starts (this is the “avenue” through which the final approach to Mt Pelvoux is done). From there, if I remember correctly, they tackled some minor peak. The whole trip became a recognition mission for an attempt we made some days later (one that would not include the crossing of the Violettes, but only the summit of Mt Pelvoux, returning along the same path of the ascent). Later on that day, 10 of us set out to ascend the glacier du Sélé, which would take us to the col du Sélé, more than 3600 meters high. The group was led by Jon, who had been there in the last year and knew the route. We started late (it is difficult to make lots of people move quickly). Jon was worried because we needed to climb a 200 meters rock face to get to the bivy site, and although it was just a scramble he didn’t want to do it before it got dark (especially because among the 10 we had some inexperienced members). So we imposed a quick pace -especially me, who was one of the pace setters for quite a while. We got to the fixed ropes on the rock face just in time to reach the top before the light was gone. But I was exhausted. I felt more of a weakness than actual tiredness, as if my body core, not my legs, was asking for relaxation and pampering. A feeling that I ultimately awarded to the effect of height, lack of hydration and haveing not eaten as well as I should have. After the bivouac, which if I remember correctly lasted until 4 in the morning, the poor sleep was added to the bag of weaknesses. On the way up we had already lost Keith, who was too tired and decided to return to the campsite before reaching the wall, and Priit and his girlfriend Hannah, who were walking much slower (they ended up bivying on a ledge on the cliff). On waking up at the bivouac I took a few sips of water and ate a cereal bar. It was seven of us, and we split up in two ropes. Jon led the first one, with Claudia (his girlfriend), Sasha and Fabien. I led the second, with Katie and Chris (I think that it might have been a good idea to let Chirs lead, but it just happened in this way). I believe that we did set up too tough a pace again; the only people who seemed not to suffer were Sasha and Fabien (which throughout the trip demonstrated an enviable state). In the middle of the glacier, after a long fight against the resistance of my body to move forward, fate gave me the opportunity to walk back. Jon asked me to come to him and Claudia, whom he had been talking for a minute after stopping the march. When I got there she had a shaken appearance. Jon told me that she could not go any further, and suggested that he went down with her, and I stayed with the rest of the group and led them to the col. But between my own weariness, and the fact that he knew the route better and had more experience I suggested we did the opposite. Luckily, he accepted. I roped up with Claudia and we started our way back. Although the body thanked me, something in me began to feel a greater sense of frustration. I needed to accomplish a mountaneering goal in this trip, and it was proving and elusive task. We set a slow pace with Claudia. When we got to the bivy, we stopped to take the most wonderful nap, lulled by the sound of the river which barely shaded the rocky silence, dotted by sporadic bird songs. After an hour, we resumed our journey to the campsite. The body seemed grateful for every foot we descended, although the road seemed eternal. As recovered my breath, a little bit of sorrow grew up inside me for forcing myself up to the col. I only felt consoled by the fact that the trigger for the descent had not been my own state of exhaustion. But it was not enough. I forced myself to remember how bad I was feeling and managed to get rid of the negative feelings. We spent the afternoon relaxing and chatting with Alex and Stephen and the others who were already in Ailefroide. We decided with Stephen that the next day wer were going to climb Palavar, a hill just behind the campsite, via Palavar les Flots. It’s a 400 meters long, 12 pitches, 5b max route (the previous link is wrong when stating it’s 11 pitches, but I think the last two can be done in one go). We woke up at 4 in the morning (it is always early starts in the Alps), and made the approach to the route with Alex and Sasha; they would tackle a tougher route on Palavar (with a 6b+ pitch). The early start paid off, we were the first party on the wall, just minutes ahead a Dutch couple. They were biting our heels all the time, even though we were not going particularly slow (we averaged 27 minutes a pitch). I guess it could have been done faster, but we took it easy. We felt a massive joy when we completed the last pitch and I finally seemed to have accomplished a goal (well, half of a target, because we still had to ab down). All in all it was a technically easy climb, and the main challenge was in the length of the route. The biggest exposure came during the abseils. There were several aerial ones, with the usual “harness pain”. The first abseil took us a while, and the Dutch couple was pushing us from the top. But in the subsequent ones we managed to oil (not the happiest of metaphors in this case) the whole procedure and left them behind. Back around the tents we set our next objective: Mt Pelvoux, again. This time the group would be: Alex, Sasha, Fabien (on one rope) and Stephen, Priit, Hannah and I (on the other). This time everything was better planned. We left early on Thursday after a hearty lunch. I hesitated because I was not feeling that well. I decided I would just try and go as far as I could. The plan was to bivouac 200 meters above the hut and, if we could, even still higher, to start with some extra terrain gained in the morning. We would first stop for dinner at the hut, to get well fed before attacking the hard part of the climb. I completely changed my philosophy from the attempt at Sélé. Instead of rushing it on the way to Pelvoux hut, I set myself to a slow pace. As soon as I felt my heart rate going up I just slowed down. So much was this true that most of the group went ahead of me. I passed them while they stopped for a break, I just didn’t want to stop. In the end, it took me 3h20 to get to the hut, going from 1500 to 2700 meters (40 minutes less than it had taken Stephen and Alex in their first attempt). I was also very careful to drink enough water on the way up. And having it played that way, I barely felt tired when I arrived at the hut. The strategy worked. It was a great learning point: when on high ground better not to quicken the pace (unless you need to avoid too much time of exposure to objective dangers), you must listen to the body, go little by little, get acclimatised, eat well when you can and drink as much as you can. I hope I never forget this lesson and take advantage of it in future mountaineering projects. But when you are in the hands of nature, there’s so much you can do. So this attempt also had its mishaps. Upon arrival at the hut we asked for dinner, but we were told we should have booked in advance. In the end, after some consultation, the cook and the guardian agreed to serve us soup and omelettes. We were thrilled by the idea. But we had to wait. It was just 4:30 or 5pm and dinner was served at 6:30. We had some rest. Since we got to Ailefroide, every day it had been raining for two or three hours in the afternoon. The storm usually started between 3 and 7 pm, at the latest. We expected to get to the hut before the storm, and we did. The plan was to dine while the water was falling and approach the bivi when it stopped. But the rain didn’t stop. When we were finishing the delicious soup and the sublime omelette it started. At 9 we started to worry, because there was little sunshine remaining. But around 10, when the storm was still in full throttle, we got discouraged. We were going to have to leave in the dark, get soaked and get a few miserable hours of sleep before starting the truly hard part of the climb. But the guardian surprised us again with his kindness: out of the blue he offered us to stay in the room used for cooking by the guests. It was a blessing. We rested very well, despite the snoring (mainly mine). And at 3 in the morning we woke up, quietly and very efficiently prepared the equipment and our light backpacks (we left the sleeping bags and other bivy stuff in the hut) and began the walk towards the upper parts of the massif. Alex, Sasha and Julien went ahead, decided to get to the top of Mount Pelvoux. My, led by Stephen, chose to go a little slower (Hannah did not have much experience in the mountains and had a slower pace) and decided to make a call later of whether trying to go all the way up Mt. 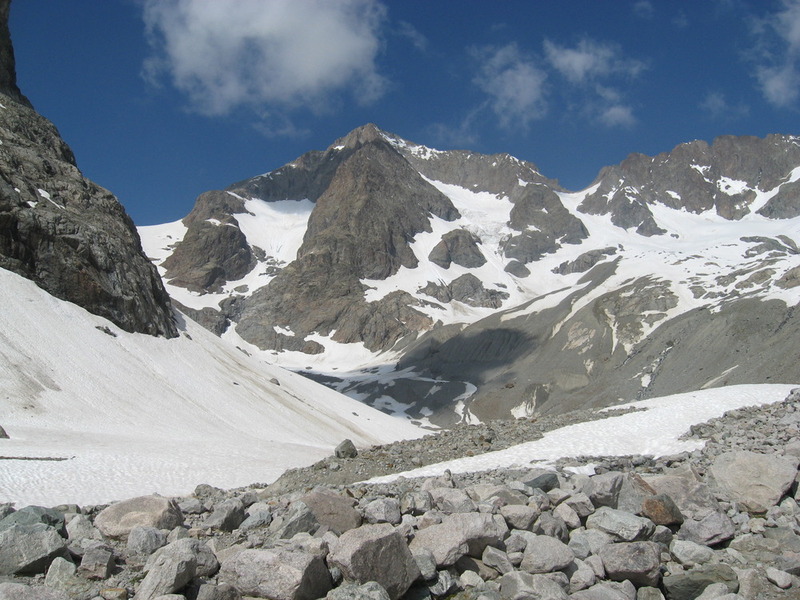 Pelvoux or better take on one of its satellites, the Aiguille du Pelvoux. With the torches on, we passed the first obstacle, a short scamble to get to the top of a sort of moraine that leads to the snow slab where the climb towards Pelvoux and its satellites actually starts. Shortly after passing the wall I realized that I had a pocket of my jacket opened, the one where I had put the GPS Gema had given me as a present. It wasn’t there any more. I got into a really bad mood, I left the rucksack there and I ran downwards looking for it. I was very, very lucky. Just before starting to downclimb the wall, another group appeared on the trail. The man fronting it put his arm forward showing an object and said “GPS?”. Yes, that was it. “Merci! Très bien!” I mumbled in my pitiful French. Contrary to the mandate that I had self-imposed, for wanting to reach my group as soon as possible and not to waste time, I hurried up towards the backpack. It took me ages to recover my normal breathing while still walking towards the snow. Luckily the sensation of weakness I had felt in Sélé did not return. Stephen was very kind. He was waiting for me halfway up. When we reached the start of the snowfield, we fit our crampons on, grabbed the ice axes, and started the ascent of the giant white dunes. Stephen in front, Hannah and Priit in the middle, myself at the back. When we reached the Coolidge couloir, which was the place where we would decide which way to go, we saw that the groups that were already on the couloir appeared to be slow-moving or just static. Stephen suggested that we opted for the less demanding auguille du Pelvoux, which would take us less time, avoiding an exposure to too soft a snow and rock falls if it got too late and the sun had hit the massif for too long. I thought it was a very good decision, the rest of the group agreed. Being four -and uneven-, our progress was always going to be slow. And it had an extra advantage. Because almost every other group of climbers went for the summit of Mt Pelvoux, we had our own route all to ourselves. We reached the base of the needle, left the bags securely tied to a block of rock (Priit had dropped a bottle of water earlier and it just went zooming down the snow, Hannah did the same with a Spfork) and I led the first 50 meters of a steep couloir (I would say the equivalent of a Scottish Grade I). Hannah and Priit followed, and finally Stephen, who led the rest of the couloir up to the base of the rock needle. We all met there. I tried climbing the 20 to 25 meters of rock to the top of the auguille, but with the crampons on I did not feel entirely comfortable, and after about four meters I went back down and I told Stephen that I would need to take off the crampons and also place protection on it, even though it was relatively easy (a VDiff, possibly). He was concerned about the time and feared that getting everyone up there would make us run out of time. So I kept the crampons on and went up a smaller aiguille, just about four meters high (a very very small practice of dry tooling, say). But that was enough to offer us a spectacular view of the sorroundings. I belayed everyone up, and then down. Then Priit belayed me from below, after passing the rope behind a rock that was by my side. We recovered the rope and we set up ab abseil, using an ab tat someone had left there (it was actually a rope, and looked very strong). Stephen was right with timing. The whole abseiling took ages. I went first, and instead of going straight down, I moved to the left, to a rocky area that I thought would make our descent to location of the backpacks easier. It was a difficult abseil, because it was well run to the left, and we had to be careful not to swinging or locking the rope when we tried to recover it. Thankfully, there was no problem with that. When we all met at the end of the abseil, I belayed the three for down climbing the rock bit that lend towards an easy snow patch. I then scrambled down. We met around the rucksacks and started the descent to the hut. I was feeling happy and fulfilled. But we had not yet finished. The snow was still good, but it already showed some signs of being hit by the sun for some hours. We moved as quickly as possible, and some of the vertical walls surrounding the white valley we were in displayed magnificent avalanches. We crossed a couple of cracks and took a deep breath when reaching the moraine. We took pictures smiling, took off the crampons, put away the ice axes and went to meet the rest of the group. The other three were waiting for us looking very tired but extremely happy after having reached the summit of Mt Pelvoux. We bought slices of delicious raspberry tart. We rested for a while, and started the descent to the campsite, each on his own, in pure introspection. If there are no errors in the GPS data, we covered around 21km in 17 hours, from 1500 to almost 3700 meters high. I was very pleased, since I had only set the goal of reaching the hut at the beginning of the journey. In the meantime Alex cought up with me. He was super tired. Tired but happy, like everyone else. We went down at a good pace but not that much. That night Stephen decided to make good use of a grill his daughter had given him, so I bought some kebabs in the Spar and we had a bellyful, with some red wine in front of the fire. It was Friday night. We left Ailefroide on Saturday morning. But before we jumped on the car for a long ride home, we went to climb a couple of short routes as a farewell. I did a 5a (the one Stephen and I considered a 5c) and then a couple of 5b (I did one twice, because I took the wrong line -purism, I suppose). That whole week was another wonderful experience on the mountains, enjoying nature and the good things in human nature, as it was made evident by the Pelvoux hut guardian, the man who handed me the GPS and, above all, my climbing friends from the BCC.